Celebrating cultural diversity and the creative power of music, The New Messengers was founded as a melting pot of new genres, artistic exploration and international jazz. The compositions are all original pieces with influences from the jazz, Latin, Classical, Middle Eastern, Mediterranean and African music. The New Messengers has been captivating audiences with its charismatic, spontaneous and rich sounds. Members: Sissy Castrogiovanni (Italy), Henrique Eisenmann (Brazil), Ehud Ettun (Israel) and Jorge Perez-Albela (Peru). Henrique Eisenmann, pianist and composer, presents a style that combines influences from Classical music to the most modern jazz, passing through the Folk music of Brazil and South America. Henrique was acclaimed by the Latin Beat Magazine as a “truly impressive Brazilian pianist”. Sissy Castrogiovanni, singer and composer, is mainly influenced by Mediterranean music with Sicilian roots. Her voice is distinguished by its warm and rooted tone. Sissy has collaborated with Bobby McFerrin and Joey Blake, among others. Ehud Ettun, bassist and an extraordinary composer, has created a unique sound characterized by a spirit of devotion and exploration. Ehud has worked with George Garzone, Danilo Perez, Fred Hersch, Anat Cohen, Eli Degibri, among others. Jorge Perez-Albela, drummer, percussionist and composer initiated his career in Lima, Peru, accompanying artist such as Eva Ayllón, Jean Pierre Magnet and Gianmarco. During the 90s, Jorge immigrated to the USA, where he has since developed a style that combines influences from Africa, South America and Jazz. Jorge has performed with Danilo Perez, George Garzone, Avishai Cohen, Ruben Blades, Bert Seager, Maria Schneider, Claudia Acuna, etc. As main attractions, the current edition of the Jazz en Lima Festival will feature the excellent Italian duo Musica Nuda, featuring vocalist Petra Magoni and bassist Ferrucio Spinetti. This duo has more than 10 years of successful productions and releases, in which the explosiveness of jazz improvisation is combined with theatrical elements and a deep knowledge of Music History – from Baroque to pop music – featuring unique versions of some of the most famous songs from the universal repertoire. Another highlight is the band The New Messengers, which features talented musicians such as Italian vocalist Sissy Castrogiovanni, Israeli bassist Ehud Ettun and the Brazilian pianist Henrique Eisenmann, described by the “Latin Beat Magazine” as a “truly impressive musician”. Regarding the musical exchange between local and international musicians, the project “Confluencias” is particularly interesting, created by Peruvian musicians José Luis Madueño and Andrés Prado especially for the festival. 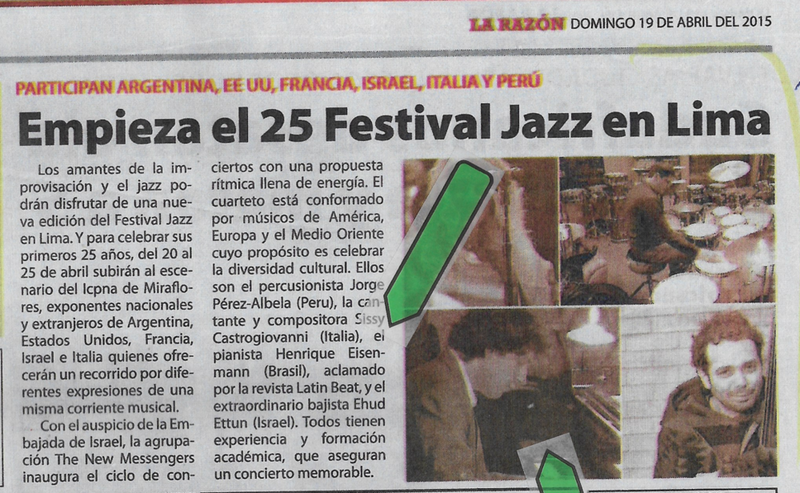 The lovers of improvisation and jazz will be able to enjoy a new edition of the Lima Jazz Festival. From the 20th to the 25th of April, to celebrate the Festival’s 25th anniversary, national and international musical exponents will perform in the ICPNA (North American Peruvian Cultural Institute) in Miraflores, offering different expressions of the same musical current. With the sponsorship of the Israeli Embassy, the band The New Messengers will start the concert series with a rhythmic and energetic show. The quartet features musicians from the USA, Europe and Middle-East, with the goal of celebrating cultural diversity. The members are percussionist Jorge Perez-Albela (Peru), vocalist Sissy Castrogiovanni (Italy), pianist Henrique Eisenmann (Brazil) acclaimed by the Latin Beat Magazine, and the extraordinary bassist Ehud Ettun (Israel). All of them have experience and academic studies, assuring a memorable concert. Composed by Jorge Pérez-Albela (Peru/USA), Sissy Castrogiovanni (Italy), Henrique Eisenmann (Brazil) and Ehud Ettun (Israel), this band celebrates the cultural diversity of jazz, also highlighting the meeting points between the different musical cultures of each member.